The U.S. Navy christened its newest Independence-variant Littoral Combat Ship (LCS), the future USS Kansas City (LCS-22), during a 10 a.m. (CDT) ceremony Saturday, September 22, in Mobile, Alabama. At the ceremony, the principal speaker will be U.S. Representative Emanuel Cleaver II from Missouri. Mrs. Tracy Davidson, wife of commander of U.S. Indo-Pacific Command Admiral Philip Davidson, served as the ship’s sponsor. In a time-honored Navy tradition, she christened the ship by breaking a bottle of sparkling wine across the bow. «The future USS Kansas City (LCS-22) is a symbol of the strong connection between the people of Missouri and the Navy and Marine Corps team», said Secretary of the U.S. Navy Richard V. Spencer. «The ship is a testament to our commitment to provide maritime dominance and power projection required by the nation, and to our partnership with industry to build the Navy the nation needs». 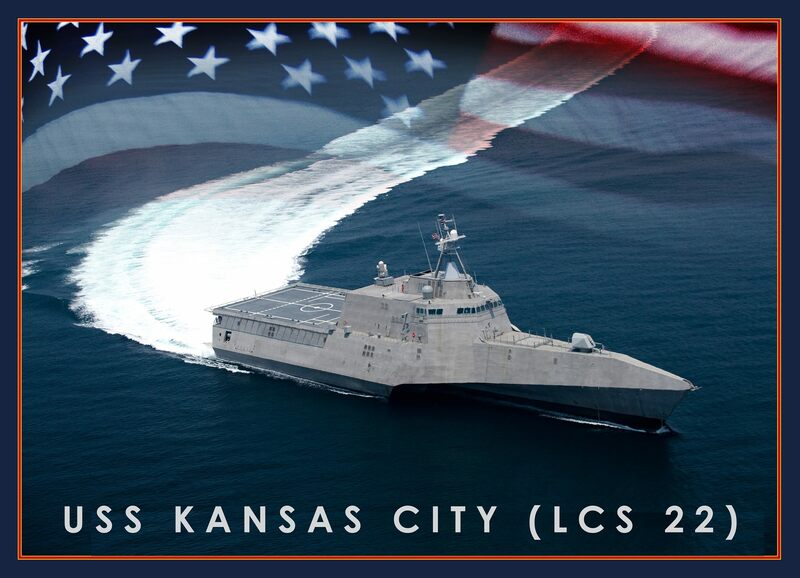 The future USS Kansas City (LCS-22) is the second U.S. Navy ship to honor Missouri’s largest city. Originally intended to be the first Kansas City, the keel was laid for what was planned to be an Oregon City-class heavy cruiser on July 9, 1945 in the waning days of World War II. With the war’s end in sight, construction was halted about a month later. The first commissioned U.S. Navy vessel named Kansas City was a Wichita-class replenishment ship commissioned June 6, 1970. The ship earned a number of unit awards throughout its life including for service in Vietnam and Operation Desert Storm. Kansas City was decommissioned on October 7, 1994. LCS is a modular, reconfigurable ship, designed to meet validated fleet requirements for surface warfare, anti-submarine warfare and mine countermeasures missions in littoral regions. An interchangeable mission package that provides primary mission systems in one of these warfare areas is embarked on each LCS and provides the primary mission systems in one of these warfare areas. Using an open architecture design, modular weapons, sensor systems and a variety of manned and unmanned vehicles to gain, sustain and exploit littoral maritime supremacy, LCS provides U.S. joint force access to critical areas in multiple theaters. The LCS class consists of two variants, the Freedom variant and the Independence variant, designed and built by two industry teams. The Freedom variant team is led by Lockheed Martin (for the odd-numbered hulls). The Independence variant team is led by Austal USA (for LCS-6 and the subsequent even-numbered hulls).